I just unpacked my winter clothes and noticed several moth holes in my wool coat. What can I do? Unfortunately the damage is already done, but there are steps to prevent this from happening again. Clothes moths are attracted to all animal fibers including wool, feathers, and fur. The presence of adult moths in your closets, on wool rugs, blankets, fabric wall hangings, or animal trophies is an indication a problem exists. Their offspring, during their larval stage of development, are responsible for the damage to your garments. If moths and their larvae are found, vacuum the article, have it dry cleaned and store in protective packaging. Enviroguard pest management professionals will use pheromone traps to determine where infestations are located and then treat with residual sprays. 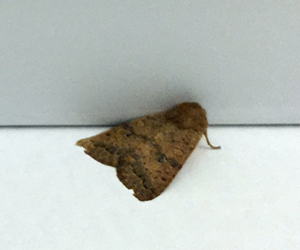 Moths such as the Indian meal moth, Angoumois grain moth, and the Mediterranean flour moth are known as “meal moths.” They are commonly found in kitchen pantries. The larvae of these insects damage a variety of goods such as cereals, flour, meal, macaroni grains, grain-based products, seeds, crackers, nuts, candy, chocolate, dried foods, and oatmeal. Control is best done by removing the infested product. If any adults are found on walls or ceilings, remove them up with a vacuum cleaner. Enviroguard pest management professionals will use a residual crack and crevice treatment in the infested areas. What can I do about the moths I see in my flour and corn meal? A number of pantry pests can invade stored food products. These are probably Indian meal moths but there are a number of food-infesting beetles too. These pantry pests are a growing problem as more families are storing extra food or buying in larger quantities from warehouse stores. Dispose of your infested flour and meal and take care to buy from stores that are sanitary, have a high turnover of flours, beans, and dried fruits, and frequently rotate their stocks. Store these products in tightly closed containers preferably in the refrigerator and dispose of the original packaging. Store pet food in bins as well and separate it from human food. Do not forget that decorative arrangements of dried wheat, corn or seed-bearing plants are often sources of rice weevils or pantry pests. Call your Enviroguard pest management professional to treat infestations. Do not try to treat them yourself with over-the-counter spray insecticides as you may contaminate other foods.